Travel with Kevin and Ruth! : What do we eat? No lunch...we were in town doing groceries that day and we ate some snacks on the way home and had an early dinner! So there you have it. We eat really well. No deep fried food, and very little processed food. Contests ends tomorrow night. Hey, you might as well enter...somebody has to win, so it might as well be you! Our long weekend with the campers went well, other than the water still shutting itself off for no apparent reason. They've let some water out of the lake, and the level is really low, so that's not helping matters. Another couple of weeks and it should be rising nicely. Certainly a more peaceful weekend than that party weekend at the park last year! Young great horned owl. Not sure that it's a "baby" any more! Yesterday it rained on and off, and I spent some time in the shop. I LOVE the nice big shop that I've got for the season. Kevin, working on one of our Gators. Oh man, seems everywhere I look there's food. Getting hungry. Nice shop to work in for the summer. It's great that they have everything you might need or can think of. Kevin quite enjoying the workshop, especially on a rainy day like yesterday, he can just putter away in it. What they don't have, he can buy within reason of course! Maybe the pump shuts off because it senses adequate pressure---like RV pumps do. So perhaps the big check valve needs an overhaul. One of the things I miss most as a fulltime RVer is a nice shop! Gluten free menu looks amazingly easy and tasty---already love Corn Chex and milk. I'll do a full blog post tomorrow about our water system and it's problem. Kevin, when the pump shuts off, what are the symptoms - pops a gfi, breaker, has its own reset....? LOVE the owls! I'll do a detailed post tomorrow about our water system. maybe you or one of our readers can help, because what's happening is a bit of a mystery to me! Thanks for doing this - appreciate the food ideas - we'll be trying some of them. Did you ever try toast with peanut butter and King's syrup? Or your brand of syrup you shared - so yummy! That owl photo is just too dang cute! Looks like he/she is posing for you. Nice workshop, Kevin! Let me know if you need any recipes. No, we haven't tried that before, normally we don't like the store bought syrups other than maple syrup and because it is expensive we usually save that for pancakes and ice cream. I love watching the owl, today it made it's way out onto the tree branch so it won't be long before it starts to fly. Thats a pretty good balanced diet, we do something similar, only not as much gluten free. We think it's pretty balanced. We eat gluten free because we have too. It may be a little more expensive but we don't notice any difference in the quality of our food or in the taste, it's still delicious. In your detailed post tomorrow, type of pump, above ground, deep well with 2 or three wire, type of pressure switch, regular or with low pressure cutoff with reset lever? What cuts off, power to the pump or only low pressure safety? All needed information for diagnosis, also, if it's a deep well pump, there is a control box with a capacitor and relay inside mounted near the power source breaker, that could be the problem. Yes, Kevin will try to be as detailed as possible in his blog post on the water pump tomorrow. Thanks Mickey. Another great header picture - interesting variations of the green tone. Thanks Elaine, we took some more this evening that should be pretty good too. Yep, we are starting to get some green. Thanks so much for this list of meals. From reading it, it doesn't look like it would be terribly more expensive, just the bread if you don't bake it yourself and the pasta. Great of you to go to the trouble to record and publish it. Thanks again! Love your junior great horned owl. How wonderful to be able to see him/her grow up. 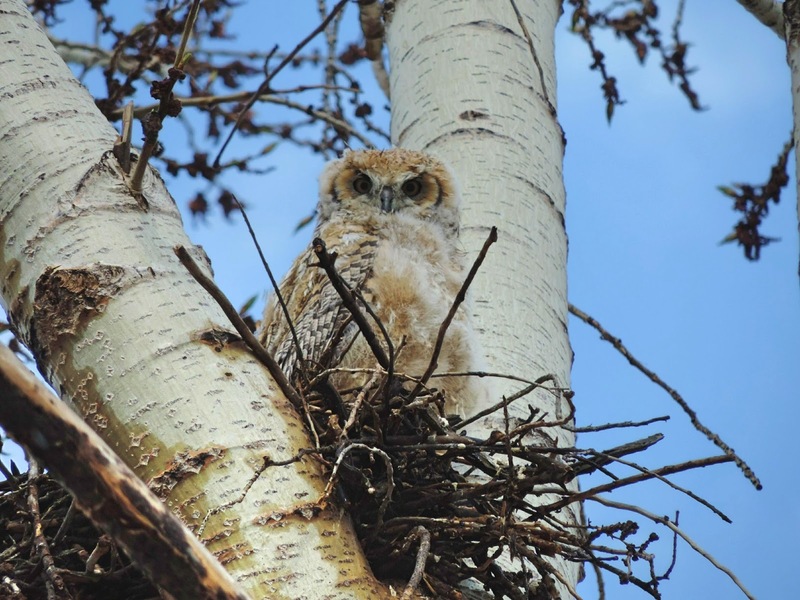 We think it is so neat to have an owl family right here in our park. We have never seen a young owl before so we are just loving it. You might have been drooling over the menu if there were more pictures of the food but you're a guy so, I understand your attraction to Kevin's workshop, Paul. I saw some Udi's gluten free bread at Walmart for about $5 per 12oz loaf. Ruth, what is your cost per homemade loaf? To be honest I am not quite sure, our daughter has worked it out and I know that she generally won't buy store bought bread unless it is under $5. I think it is somewhere between $4 and $4.50CAN. The last 2 weeks we have bought bread on sale for $3.78 which I know I can't make it for less than that. When she gets back to me I will let you know how much it is. Dugg, she said that the material alone is about $2.5 but that was about a year and a half ago, so I figure it is somewhere between $2.50 and $3 now plus the time and effort that goes into making it. Thanks for the link Emily, it is an interesting read and the very first paragraph in the article fits me to a "T". Those were my symptoms exactly. I was diagnosed through a medical physician although I didn't have the celiac test done as it isn't covered under our provincial medical plan, instead she told me to go gluten free for a month and see if I noticed a difference which I did, within a couple of weeks and I have never gone back. My symptoms have disappeared, I gained back my weight and I don't take iron supplements anymore. Kevin, did his through self diagnosis and has found that the symptoms that he was noticing have also disappeared. As with any article on this subject you will find many that have differing ideas and many of them from professionals. I think everyone should do what makes them feel their best and stay their healthiest, whatever that may be. Your healthy eating is impressive. Please share again anytime.. gives me some ideas. What kind of cheese is that with the turkey sandwich and is that deli turkey? That cheese is "Cabot" cheddar cheese that is unfortunately only available in the United States. It is made in Vermont and is delicious. We brought 3 2lb (907g) bricks back to Canada with us when we came back through the USA in April. Yes, that is sliced turkey from a deli. Wow, what great eating habits you have! I would so love your curry recipe, Ruth. One day when we don't have anything to talk about I will post the recipe if that's what you call it. I don't really have a set recipe but I do have the ingredients and instructions written out. Our son asked for it one day so I had to put it down in writing. If you would like a copy sooner, just send us a quick email (our email address is in the right column at the top of this page) or if you are on Facebook then send us a private message with your email address.